Ecometals Limited is pleased to announce the publication by the Departamento Nacional de Produção Mineral (DNPM) in the Diário Oficial da União No 236 approval of Processo 858006/2009 in the Pedra Branca do Amapari municipality in northern Amapa. The Pedra Branca Processo (tenement) is prospective for three important commodities: gold, manganese and iron, and is adjacent to the tenements covering the Amapá Iron Mine and the Amapari Gold Mine, and is along stratigraphic trend from the Serra do Navio Manganese Mine. Publication of Processo 858006/2009 in the Diário Oficial grants an Alvarás de Pesquisa (Exploration permit) for an initial three year term, and is renewable on submission of regulatory reports and approval by DNPM. The Pedra Branca tenement covers an area of 8629.92ha in the Pedra Branca do Amapari municipality. There are three large scale mining operations in close proximity of the Pedra Branca tenement. The Pedra Branca license directly adjoins the tenements of the Amapari Gold Mine and the Amapá Iron Mine (see map below). The Amapari Gold Mine is located 8km NE of Pedra Branca, and owned by Mineração Pedra Branca do Amapari (a wholly owned subsidiary of New Gold Inc), with published resources of 22.9Mt @ 1.5g/t Au Measured and Indicated and 13.7Mt @ 2.37g/t Au Inferred (MQes, AMEC and NCL Brazil, 2008). The open pit heap leach operation produced some 190,000oz of gold over two years of operation before being put on care and maintenance in early 2009. Near-mine exploration continues on the property. The Amapá Iron Mine is located 9km NE of Pedra Branca, and is operated by Anglo Ferrous Brazil (a division of Anglo American PLC), with published NI43-101 compliant resources of 73.63Mt @ 39.59% Fe Measured and Indicated and 104.54Mt @ 40.99% Fe Inferred (SRK, 2007). The Serra do Navio manganese mine is located 14km NW of Pedra Branca, and was operated by Industria e Comercio de Minieros SA (ICOMI) from 1957 until closure in 1997, producing a reported 34Mt of commercialised products. Ecometals own 66.67% and operate a joint venture company with ICOMI (now Alto Tocantins Mineração Ltda), which owns stockpiled manganese mineralised material at Serra do Navio. ICOMI previously reported in situ (in ground) resources at Serra do Navio as 1.2Mt oxide @ 38.43%Mn and 4.4Mt carbonate type @ 30.61% Mn mineralised material (Costa, 1997). Stockpiles are estimated at 3.3Mt manganese mineralised material, with grade ranges from grab samples from 28.3% to 45.3%Mn, but there has been insufficient work to determine the inherent inhomogeneity of the material and the samples are not considered representative of the total volume of the stockpiles. Neither the in situ resource nor the stockpiled mineralized material at Serra do Navio are considered current Resources by the Company according to CIMM/JORC definitions. Resource estimates quoted herein are indicative only and should not be relied upon as definitive. The Company considers the mineralized material as an exploration target which needs further work to upgrade the confidence in the resource. The Company is planning to beneficiate the stockpiled manganese mineralized material from Serra do Navio and commercialise the upgraded mineral products in 2010. The Pedra Branca Gold Project is underlain by the Vila Nova Group, a sequence of Lower Proterozoic metamorphosed volcanic and sedimentary rocks within the eastern part of the Guyana Shield. The Guyana shield stretches from northern Brazil to Venezuela is host to several world class gold deposits, including Las Cristinas 8Moz (Venezuela), Omai 4Moz (Guyana) and Rosebel 3.2Moz (Suriname). Serra do Navio Formation in the Vila Nova Gp is a metasedimentary sequence with sediments rich in manganese or iron. The sequence consists of quartz-biotite-garnet schist hosting the manganese deposits, lenses of carbonaceous schist (manganese protore) and subordinated quartzites. In the Amaparí Gold Mine area the metasedimentary sequence consists of BIF with magnetite, hosted by hornblende schist, para-amphibolites and quartz sericite schist. Gold mineralization at Amapari is of hydrothermal origin and is hosted by magnetite/hematite BIF. The Amapá iron mineralization is the continuation of the same BIF stratigraphy. Stratigraphic trends of the manganese-enriched horizons at Serra do Navio, and structural trends controlling the gold mineralization at Amapari both extend through the Pedra Branca tenement area. 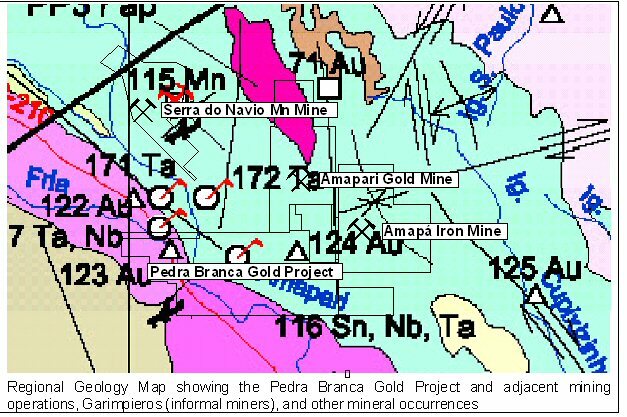 The Pedra Branca tenement also covers gold anomalies in soil and stream sediments from a regional survey conducted by AngloGold in the mid-1990's which led to the original discovery of the Amapari gold deposit (SRK, 2008). The Government MINDEP database of mapped mineral occurrences indicates several artisanal gold mining sites and other mineral occurrences within and nearby the tenement. The exploration programme planned for 2010 includes validation and focus on anomalous geochemical areas, aeromagnetics interpretation, and detailed ground magnetics surveys. Quality control on all surveys and geochemical analysis will follow industry standard protocols and be under the direct supervision of the in-house Qualified Person, SR McMullan, P.Geo. Further details and maps of the Pedra Branca Gold Project and other exploration and development projects can be obtained from the Ecometals Web site (www.ecometalslimited.com). Chief Executive Officer Fran Scola said, "Ecometals strategy is to be a South American gold-focussed exploration company. The Piedra Branca acquisition underlines this strategy and is underpinned by the skills of the Company's personnel to find new and exciting opportunities. The Guyana Shield is an exciting geological environment and Ecometals through its strong commitment to Amapa is well placed to seek and develop these opportunities."